How can you hate me if you don't even know me? Anti-racist activist or Uncle Tom? 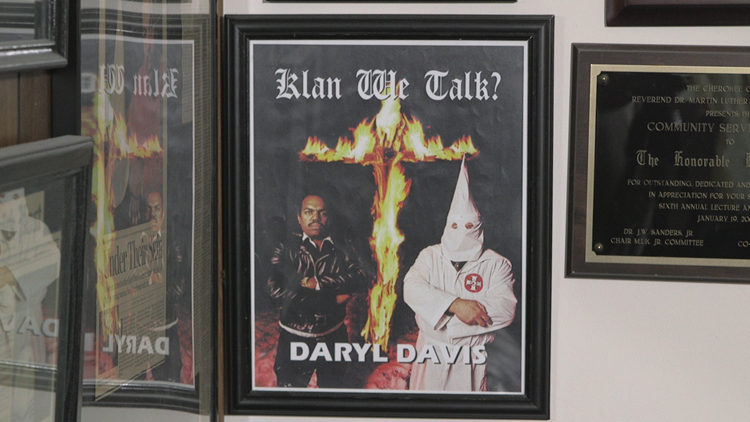 Walk into Daryl Davis’ home in Silver Spring, Maryland, and you’ll see photos of him lining every wall. The accomplished musician has photos of himself alongside legends like Chuck Berry and Jerry Lee Lewis. Even more eye-catching are the photos of Davis amongst men in robes and pointy hoods. You see, for decades the black musician has been befriending and converting members of the Ku Klux Klan. Davis spent most of his childhood abroad, following his parents who worked in the United States Foreign Service. His diverse international education was crucial in shaping his views on race. While Davis was in class with children from all over the world, schools in the U.S. were only beginning to desegregate. When he returned to the states, race relations were the last thing on his mind. Davis was one of two black children in his new school. When his friends got him to join the Cub Scouts, he was the only black scout. In 1968, during a statewide Boy Scout march to celebrate the ride of Paul Revere, Davis was chosen to carry the American Flag at the head of his troupe. When people in the crowd started to throw bottles and rocks at him, his first thought was “oh, these people over there don’t like the scouts.” It was only when his troop members and leaders started blocking him from the debris with their bodies that he realized he was the only person being targeted. His parents explained racism to him for the first time that day. Davis couldn’t comprehend why someone would hate him for such a strange reason. And so began a lifelong quest to answer one question: How can you hate me if you don’t even know me? The original cover for Daryl Davis' book on the Ku Klux Klan. It was later renamed Klan-destine Relationships: A Black Man’s Odyssey in the Ku Klux Klan. Davis’ quest led him to write Klan-destine Relationships: A Black Man’s Odyssey in the Ku Klux Klan. He interviewed countless Klan members to get to the heart of their hatred. It all started when a Klansman happened to come to one of his gigs. Although he was surprised to see a member of the KKK at his show, the man continued to show up to hear his music. Davis used this connection to score an interview with Roger Kelly, the Grand Dragon or State Leader of the KKK in Maryland. Davis' assistant called Kelly for the interview. 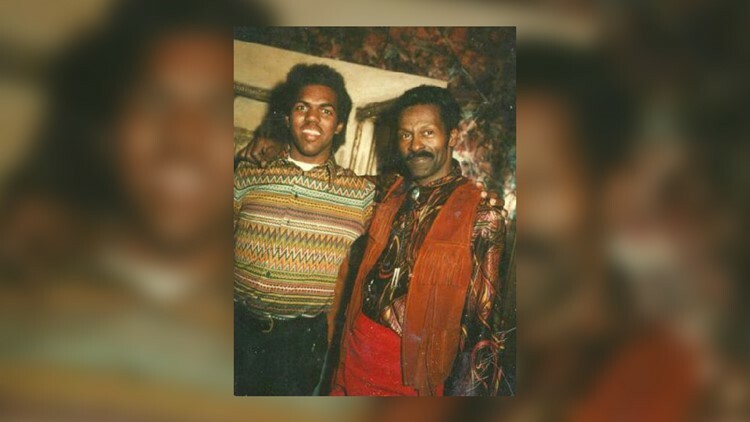 She didn't mention that he was a black man, and Kelly didn't know until he showed up to meet him at a motel above the Silver Dollar Lounge in Frederick, Maryland. After a long and tense conversation, which Davis recounts in his documentary Accidental Courtesy, the two men shook hands, the Klan leader said “Stay in touch,” and he gave Davis his business card. Nevertheless, Davis began to invite Kelly to his gigs and even to his house. 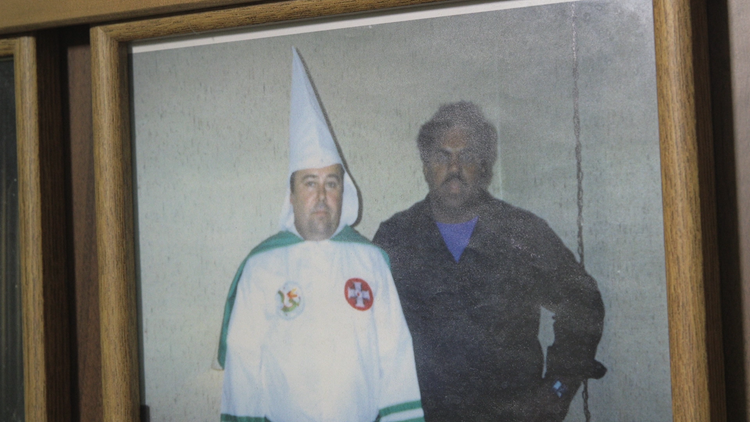 Daryl Davis and Grand Dragon, or State Leader Roger Kelly of the KKK in Maryland posing for a photo. After several years of correspondance with Davis, Kelly left the KKK. Davis, in turn, began to attend Klan rallies. He met more members, and collected more interviews. Roger Kelly quit the KKK. Kelly gave Davis his robes when he quit, and over the years Davis has collected more than two dozen similar robes. It isn't easy sitting down with someone who hates you. Davis admits controlling his temper can be difficult at times. Sometimes he even fears for his safety. But after decades of experience, he’s learned the secret to having these tough discussions. “The greatest weapon I have is information,” says Davis. When Davis sits down with a member of the Klan, or any number of bigoted organizations, he often knows as much or more about the organization than they do. There’s nothing a Klan member, a white nationalist, or a neo-Nazi can say that Davis isn’t expecting. 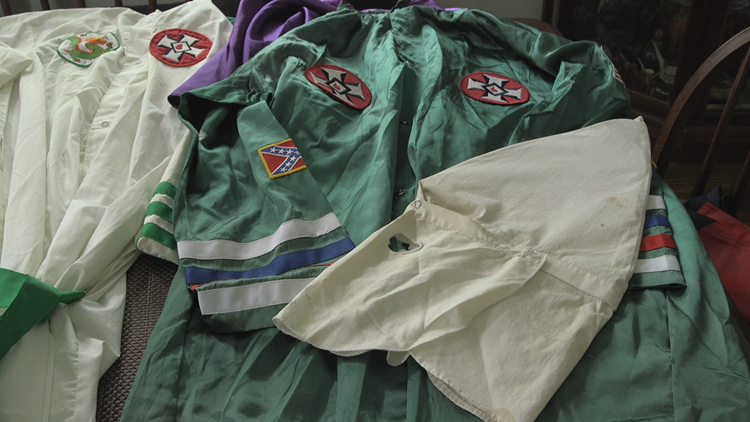 Davis plans on opening a museum one day featuring all of the Ku Klux Klan memorabilia that he's collected over the years. According to Davis, engaging with those whose values are completely opposite of your own is an invaluable experience. “When you are actively learning about someone else, you may not realize it, but at the same time you are passively teaching them about yourself,” says Davis. It’s this philosophy that drives Davis to seek out these conversations. Davis has been doing this work for over two decades. He credits his background as a musician for preventing burnout. Blending ideas and bringing harmony to differing opinions is as natural for Davis onstage as it is offstage. But Davis isn't the first person to use music to fight injustice. He considers his musical roll models pioneers of the civil rights movement. Legends like Elvis Presley, Jerry Lee Buddy Holly and Bill Elliot's music got their audiences up on their feet and dancing together in venues that were still segregated at the time. While activists were marching for their rights in the street, a different kind of battle was being fought along to rock 'n' roll beats. Despite his efforts, Davis’ mission is controversial, and many activists have questioned his actions. In his documentary, Davis gets into a heated conversation with Black Lives Matters activists Tariq Touré and Kwame Rose. Rose questioned Davis’ end goal, and whether Davis is doing “wasting time going into people’s houses that don’t love [him].” To Kwame and Touré, there were much bigger battles to be fought Davis believes his critics just don’t understand. 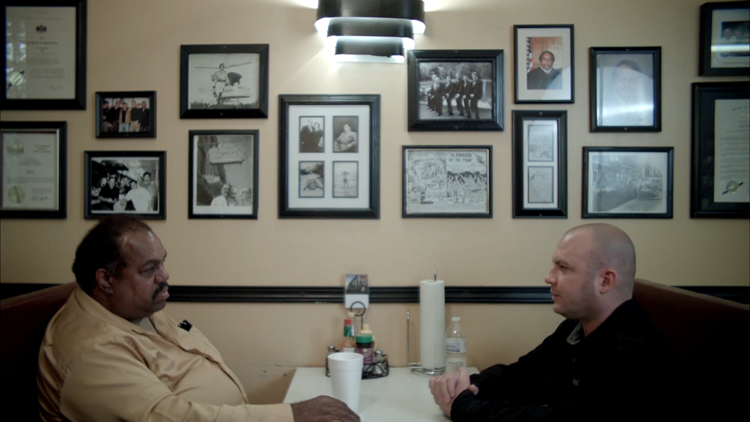 In this screen cap from his documentary Accidental Courtesy, Daryl Davis sits down to talk to commander of the National Socialist movement Jeff Schoep. At the end of the day, the insults and name calling don’t sway him.